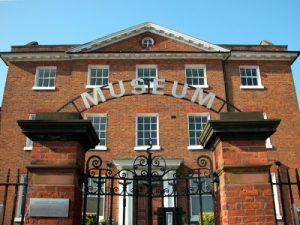 The Watford Museum in Hertfordshire offers various galleries including Watford history, Watford Football Club, Cassiobury, fine art, sculpture, the fire museum, and space 2. The town of Watford was only a settlement in the 12th century. It all began with Abbot of St. Albans, when he opened a market along the route that many travelers used and which was still in use until 1928. The first church was also erected by the Abbot. The Watford Football Club is one of the galleries is home in what at one time was the Benksins Brewery Mansion. A few of the items on display include photographs and player cards from the 1890’s as well as the trips to Wembley in 1984 and 1999. The Cassiobury Collection offers guests the opportunity to view of the portraits of members of the Essex family that spans over two centuries. Admission to the collection is free of charge, but the museum is only open on Thursday through Saturday from 10am until 5pm. The Watford Museum is also home to many different oil paintings in the fine art section. Here you will find wonderful paintings, drawings, and sculptures from local artists that help to show the history of the area as well at the rural and urban landscapes around the area. The fire museum section is sure to excite the kids as they can view old-fashioned fire trucks and equipment that has been used throughout history. Space 2 will be the best place to find visual artworks from local as well as national artists. At this time, the gallery is not open but will send out invitations for submissions by October of 2016. As you can see, the Watford Museum has something that every member of your family will find to enjoy. This is one museum that you should not miss while visiting Hertfordshire.